The end of Chromatic March was not the best time for me to discover Martin Scorsese's list of "The Best Uses of Color in Film, Ever, Both Foreign and Domestic." If I had discovered it earlier, I might have tried to check them all off. I might have seen Duel in the Sun instead of Mon Oncle, or Cries and Whispers instead of The Umbrellas of Cherbourg. I might have missed The Color of Pomegranates, or skipped the only contemporary film I saw, Burton's Alice in Wonderland. I might have gotten to see Invaders from Mars. Or maybe it's a good thing, I guess. 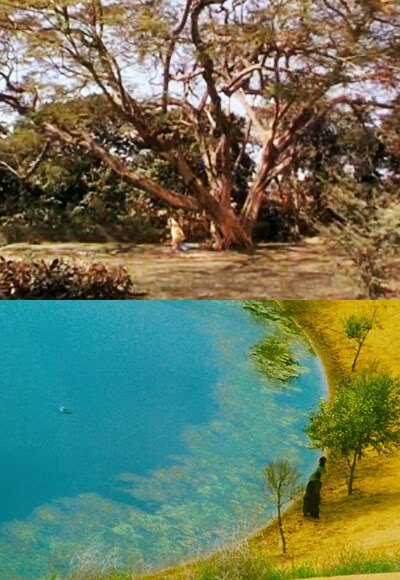 I saw a couple off there -- The River, The Red Shoes (his two favorites), and I'd seen some before: In The Mood for Love (I'm a Wong Kar Wai fan), The Searchers, and Singin in the Rain. It turns out I also would have missed some amazing stuff: Dario Argento's Suspiria, an operatic horror opus... and the desert fever tones of Ashes of Time, with its hallucinogenic woven narrative and its confessional landscapes. The general consensus seems to be that color was used best back when it was still a new thing to the cinema, in the days when Technicolor was the ruling power. In those days, stylization was achieved in-camera, as part of the set and costumes. This seems to have changed: now, color seems to be largely a product of post-production, as with Ashes of Time and Alice in Wonderland. It's so easy to take control of color on a computer now, and the hand of the director can mess with so many more dimensions of the experience. This says something about the changing nature of film. As these classic color movies have shown, dramatic stylization can be achieved even without the intervention of digital coloring software, and in many cases, these production-level palette choices are more complex, more subtle, and more interesting than the highly controlled post-production of contemporary stylists. However, it's also less predictable, and this is the name of the game: digital effects give the filmmaker more opportunities for intervention, and a higher degree of control over a finer grain of detail. Ashes of Time is an excellent example of a tightly-controlled chromatic experience. As some DVD comparisons show, there's a dramatic difference between various cuts of the film, and it's clear that these changes have been made in order to control the harsh chromatic contrasts of the film's Jianghu. Suspiria stands out among the films of the month. The later films use digital modeling and correction to introduce color choices; the earlier ones generally use objects, clothes, and colors on sets. However, Suspiria almost exclusively used light... the whole film appeared to be lit with colored bulbs, creating dramatic, unnatural gradients between red and blue. It was also one of the only films to attempt narrative continuity, but to abandon chromatic continuity: the same set, in the same scene, could be lit in red, and then cut to being lit in blue, snapping us from hysteria to paranoia and back. This is a more subtle form of experimentation than, for instance, the bizarre non-narrative world-creation of The Color of Pomegranates. 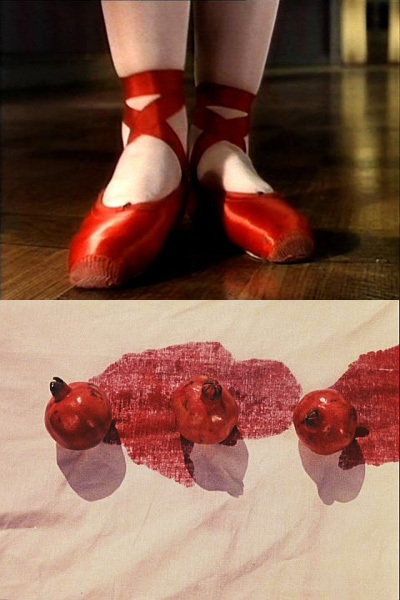 Parajanov used color as one symbolic artifact in a movie made almost entirely of artifacts: carpets, lace, knives, chickens, lambs, and people acting out roles with a cultural and psychic significance, performing a ballet in a barely-comprehensible visual language. In an unhinged film, the colors seemed like the most orderly aspect, performing their well-defined roles: red for the body, black and white for life and death. They provided the groundwork for what was essentially a visual and intuitive experience, and if you worked too hard to force it into narrative logic, it probably frustrated the crap out of you. In general, though, it was the 50's masterpieces that were the gems of this month of films: The Umbrellas of Cherbourg, The Red Shoes, and The River. These films point to a time when stylization and plot were balanced carefully, never drawing undue attention, and when sequences of events could move along with a mysterious honesty and self-evidence: without the scripted and telegraphed twists and turns of modern Hollywood, or its indulgent didacticism; and without the well-trod self-awareness and forced eccentricity of art cinema, which is creating its own consciousness of culture, but which seems to be losing touch with the human condition. This is probably hyperbole, but it's worth a moment of pause. Hope you've enjoyed Chromatic March as much as I have. Don't worry, I have another theme for next month... check in after a couple days, and I'll get started on it.